Menopause is a natural transition every woman will eventually experience. For most women, menopause typically occurs in their 40s or 50s. For some women, however, this change can occur much earlier. Because this transition happens much sooner than many anticipate, early menopause can be difficult. Fortunately, there are resources to help women better cope with the changes they are experiencing. Unfortunately, many young women have to deal with the onset of early menopause, its symptoms, and the physiological and emotional consequences. Learn more about early onset menopause, its causes, its symptoms, and the different treatment options available for decreasing symptom severity. Early menopause is the unexpected beginning of menopause at a young age, specifically before women reach 40 years old. While the terms early menopause and premature menopause are often used interchangeably, there is a distinct difference between the two. Affecting up to 4% of American women, early menopause is diagnosed when the menopause transition takes place before a woman is 45 years old. However, when the onset of menopause happens before their 40s, it is considered premature menopause. Premature menopause can even happen when women are in their teens or 20's. Even though early menopause is sometimes confused with premenopause, the latter is completely different. Premenopause refers to a woman's fertile years, from her first period until she starts experiencing perimenopause symptoms. If the signs of early menopause have been detected, there are some common tests that can be performed; these include a pregnancy test, thyroid disease test, estradiol level test, and follicle stimulating hormone (FSH) test. Click the following link to learn more about early menopause, or keep reading for more details about the symptoms and causes of early menopause. Women with early menopause will generally suffer from the same menopause symptoms as women who experience it later in life. Breast pain during early menopause is a common symptom, but the good news is, it does not have to be inevitable. Can I Prevent Early Menopause? 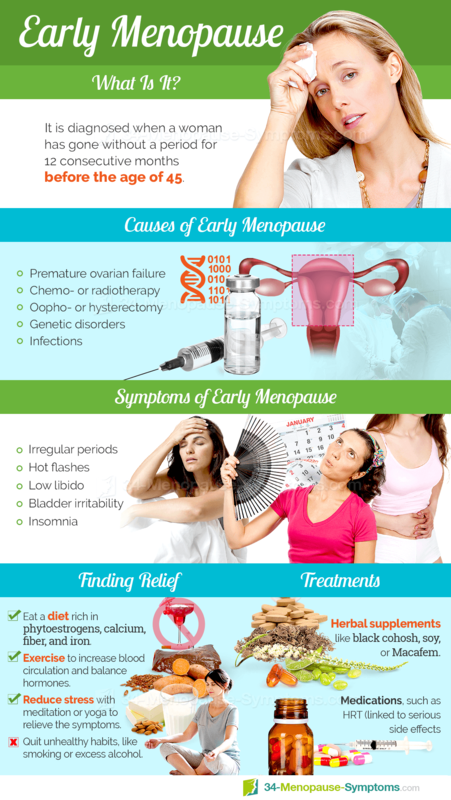 Early menopause is not uncommon, and can be caused by a variety of factors. It can be natural, or induced by certain types of surgeries, chemotherapy, or medicine. It can also be brought on by unhealthy lifestyle choices, such as being severely underweight or smoking heavily. While pinpointing its exact causes are complex, there are some natural and medical factors that trigger the onset of early menopause. Premature ovarian failure (POF). Also known as premature menopause, POF is diagnosed when a woman body's stops releasing eggs and ceases hormone production in the ovaries. It can be the result of many factors, from genetic predisposition to autoimmune disorders. Infection. Certain diseases, such as tuberculosis or mumps, can negatively affect the functionality of ovaries, leading to premature menopause. Hysterectomy. The removal of the uterus, Fallopian tubes, and ovaries causes early menopause due to the interruption of hormone production. Tubal ligation. Women who have undergone a tubal ligation procedure may experience some menopause-like symptoms. Stress. While stress itself cannot cause early menopause, it can exasperate the severity of menopause symptoms. Even though the triggers mentioned above are the most common, other contributing factors should be taken into consideration when trying to pinpoint the causes of early menopause in your case. Click on the following to read more information about early menopause causes, or continue reading to learn about early menopause signs and symptoms. It is not uncommon for women to experience early menopause, especially if they are predisposed to it because of genetics, have undergone a surgery that removes the ovaries, or have received medical treatment that damages the ovaries. Click here to read more about the causes of early menopause. Generally speaking women begin menopause between their mid-40's and 50's. Unfortunately for some women however, they can go through the transition at a much earlier age. If you're concerned about your symptoms and the chance of experiencing early menopause read on. Identifying the symptoms is essential, since they could also be indicative of serious diseases or health conditions. Click on the following link for a complete list of early menopause signs and symptoms, or keep reading to learn about early menopause symptom treatments. Early menopause can come as a shock to many women, and can present some concerns to women about what they will experience in the upcoming years. Many women begin to experience menopause symptoms such as hot flashes and vaginal dryness. Click here to learn more about menopause symptoms in early menopause. When women are diagnosed with premature or early menopause, they have to deal with both physical and emotional changes. Fortunately, there are many ways to decrease the duration and severity of early menopause symptoms. These early or premature menopause treatments are: including lifestyle changes, alternative medicine, and prescribed medications. Learn more about the different benefits and risks of each treatment option. Out of the three approaches, lifestyle changes carry the least risk. However, they entail major commitment and discipline. Techniques such as massage, yoga, or meditation are known to help women regain control of their bodies and minds. Despite such benefits, bear in mind that those techniques do not address the problem at its source. The second approach, alternative medicine, entails the use of certain herbs to alleviate symptoms. Natural and alternative remedies have been widely recognized to relieve early menopause symptoms. This approach can be very effective for many women. For some women, however, they may need more powerful treatments to alleviate their symptoms. If this happens, medications will likely be their best option. The third approach refers to the use of prescribed medications. Among the possibilities, hormone replacement therapy (HRT) is the most popular one. Unfortunately, HRT has been linked to serious health conditions, such as an increased risk of developing different types of cancer and heart disease. Learn more about the different ways to find relief from early menopause symptoms in early menopause treatments. Women who experience the symptoms of menopause before the age of forty are likely experiencing early menopause. Although menopause is a natural life transition, its early occurrence can raise concerns. Fortunately, there are ways to reduce the duration and frequency of many early menopause symptoms. Learn more about treatments for early menopause. Women who are experiencing the early onset of menopause may feel frustrated and confused, or fail to understand the changes in their bodies.Learning about early menopause is the first step to accepting the physical and physiological changes you will be undergoing during this process. Am I Too Young to Be Experiencing Menopause Symptoms? 05/14/2012 Around 5% of women experience menopause early, which is defined as menopause before the age of 45. Early menopause can increase the risk of getting certain medical conditions, so it is important for a woman to know if she is experiencing early menopause. Click here to read about the symptoms of early menopause. 12/11/2013 Menopause is defined as the time when a women has not had her period for 12 months and has entered into infertility. For some women, this time can come prematurely. Early menopause can also can bring uncomfortable symptoms such as hot flashes, vaginal dryness, and irregular periods. 11/22/2013 Early menopause can be a highly distressing time for young women, both physically and emotionally. If your daughter is experiencing early menopause, it's likely she will need your support and advice. You can help by listening to her, sharing your personal experiences, and going with her to the doctor. 12/12/2013 Early menopause can happen unexpectedly and can be upsetting for young women. It's important for women to understand the reason for menopausal symptoms and how to treat them, in order to improve the quality of their daily lives. Healthy lifestyle, open communication, and emotional well-being are key aspects of managing early menopause.